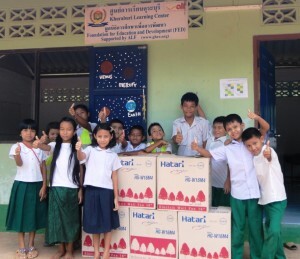 New fans in the classrooms are helping to keep the teachers and students at the Burmese Learning Center cool during these hot dry months! The North Andaman Network Foundation and Andaman Discoveries allocated funds from the ‘BLC Fund’ to purchase and make a donation to the BLC of 10 new rotation wall fans for the classrooms. Many thanks to the people who have made a donation to the BLC Fund! The teachers and students installed the fans themselves, which was a good exercise for the center to take ownership of the fans and their maintence. All are grateful for the new coolness. The BLC Fund, administered by the North Andaman Network Foundation (NAN), is firstly used for teachers’ salaries, transportation and operational cost of the center. But when the center desires something that will help make the learning environment more healthy, friendly and fun NAN will see to it that an appropriate amount of funds are allocated to that cause.